Welcome back to reality after the long weekend! I hope you all had fun. I spent Saturday with friends enjoying a Giants game and Sunday/Monday visiting my fiance's family, so I had plenty of eating and relaxation, and am getting back on track today with a 7am pilates class (ugh!). Did everybody get their holiday sales on?? I bought a couple things, but I never stop (window) shopping;) At the moment I have my heart set on a new printed maxi dress. There was a time when i thought bright, billowy maxi dresses had to be reserved for trips to the Farmer's Market and strolls on the beach, but these days printed maxis can go from an outing to the office. Add a boyfriend blazer, structured tote and pointed flats, and a printed maxi dress becomes the perfect comfortable outfit for a casual-cool office. Check out a handful of my favorite pleated maxi dresses below. If you're looking for some serious shopping though, the best selections of printed maxi dresses at all price points has to be here. By the way... Net-A-Porter just started one of their rare but amazing designer sales! Don't miss out and hit it up early, here. 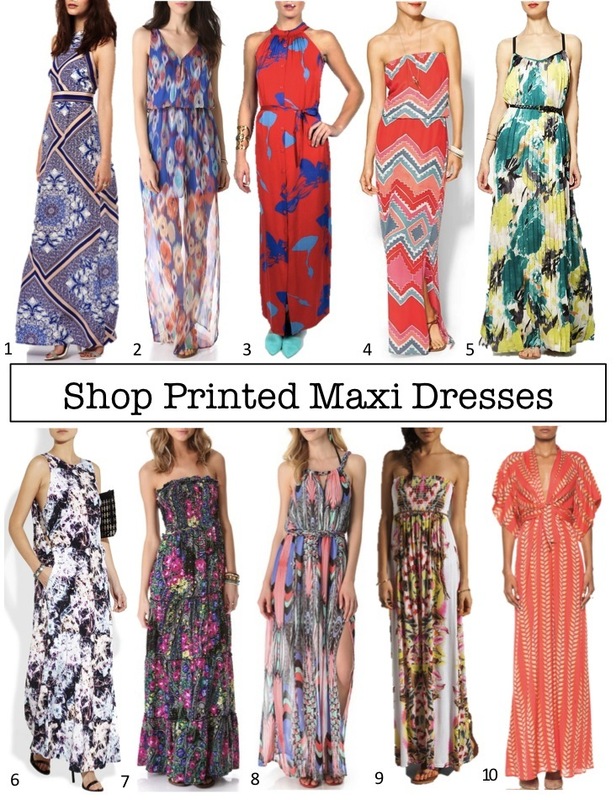 I've been on the hunt for a printed maxi, too! I'm thinking a floral version for me...everything you chose here is so pretty! I'm still trying to find out that doesn't overwhelm my short and small frame- these ones are so pretty! such fun choices, i think #2 is my favorite! A printed maxi is a summer must have! Love your inspiration and picks! I love printed maxi dresses! Such a great selection to show! Your photos show some beautiful choices. Maxi dresses are a staple in my closet...any season :) I love their versatility!! You can never have too many! Love pairing a maxi with a blazer- so unexpected! So fresh and beautiful for summer! I so want a couple of these for summer ! Who doesn't love a printed maxi dress in the summer! 5 is my fav from what you've picked! WOW! This is called perfect collection of maxi's. Love it.